SOURCE: AP/Damian Dovarganes University of California, Irvine researcher and study leader Hans Keirstead holds a special bottle with human embryonic stem cells. Imagine a day when blindness is obsolete. That day may be closer than we think. Very recently, scientists at the University of California, Irvine created an eight-layer, early stage retina from human embryonic stem cells—the first three-dimensional tissue structure to be made from stem cells, according to Science Daily. The leader of the study is UCI’s Hans Keirstead. Using a differentiation technique, whereby human embryonic stem cells can be instructed to become particular types of cells, Keirstaed and his team were able to engineer this early stage retina. Retinal engineering could be an important part of a therapy for the millions of Americans who suffer from macular degeneration and other retina diseases. Keirstead’s work demonstrates the value of embryonic stem cell research. Embryonic stem cells are unique because of their ability to differentiate into any of the 200-plus different types of human cells, which makes them the “gold standard” for conducting research on the mechanics of cell development and the generation of new therapies. Although the Obama administration has lowered some barriers to federal funding of embryonic stem cell research, the president also ordered the National Institutes of Health to adopt strict ethics guidelines. The guidelines stipulate that only cells leftover from in vitro fertilization therapy can be used to derive cells for research, donors must provide informed consent and cannot receive any compensation for their cells, and the donors must be provided with other options for the disposition of their cells before they can donate the cells for research. As stem cell therapies like retinal replacement move from the lab bench to clinical trials, the Food and Drug Administration will need to be cognizant of the new technical and ethical concerns that come with this research. To this end, we proposed in our January 2009 report, A Life Sciences Crucible, an expansion of the Recombinant DNA Advisory Committee, which was formed in 1974 by the NIH. Made up of a diverse set of experts, including scientists, ethicists, patient advocates, representatives from private industry, and so on, the RAC could behave as an oversight panel. We state in the report that “if the trials involve ‘protocols that raise novel or particularly important scientific, safety, or ethical considerations,’ then the RAC will discuss the research at one of its quarterly public meetings.” The function of the RAC will be to supplement the FDA in its efforts to monitor this new and evolving area of scientific inquiry. The research conducted at UCI may someday lead to monumental advances in the way we treat illness and injury by allowing us to live longer, healthier lives. But as is always the case when exploring uncharted territory, we must take extra care to ensure that knowledge and innovation are not achieved at the expense of our ethics or our safety. As long as we proceed with an eye to ethics, we may one day soon be able to look back at retinal diseases and spinal cord injuries in much the way we view infectious diseases, as dreadful burdens overcome by human endeavor. Michael Rugnetta is a Research Assistant with the Progressive Bioethics Initiative at the Center for American Progress. Imagine a day when blindness is obsolete. That day may be closer than we think. Very recently, scientists at the University of California, Irvine created an eight-layer, early stage retina from human embryonic stem cells—the first three-dimensional tissue structure to be made from stem cells, according to Science Daily. The leader of the study is UCI’s Hans Keirstead. Using a differentiation technique, whereby human embryonic stem cells can be instructed to become particular types of cells, Keirstaed and his team were able to engineer this early stage retina. Retinal engineering could be an important part of a therapy for the millions of Americans who suffer from macular degeneration and other retina diseases. 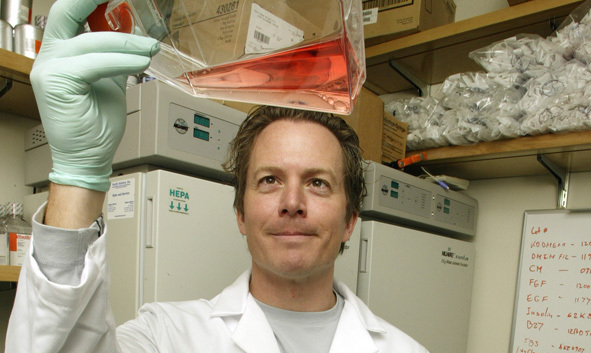 Keirstead’s work demonstrates the value of embryonic stem cell research. Embryonic stem cells are unique because of their ability to differentiate into any of the 200-plus different types of human cells, which makes them the “gold standard” for conducting research on the mechanics of cell development and the generation of new therapies. Although the Obama administration has lowered some barriers to federal funding of embryonic stem cell research, the president also ordered the National Institutes of Health to adopt strict ethics guidelines. The guidelines stipulate that only cells leftover from in vitro fertilization therapy can be used to derive cells for research, donors must provide informed consent and cannot receive any compensation for their cells, and the donors must be provided with other options for the disposition of their cells before they can donate the cells for research. As stem cell therapies like retinal replacement move from the lab bench to clinical trials, the Food and Drug Administration will need to be cognizant of the new technical and ethical concerns that come with this research. To this end, we proposed in our January 2009 report, A Life Sciences Crucible, an expansion of the Recombinant DNA Advisory Committee, which was formed in 1974 by the NIH. Made up of a diverse set of experts, including scientists, ethicists, patient advocates, representatives from private industry, and so on, the RAC could behave as an oversight panel. We state in the report that “if the trials involve ‘protocols that raise novel or particularly important scientific, safety, or ethical considerations,’ then the RAC will discuss the research at one of its quarterly public meetings.” The function of the RAC will be to supplement the FDA in its efforts to monitor this new and evolving area of scientific inquiry. The research conducted at UCI may someday lead to monumental advances in the way we treat illness and injury by allowing us to live longer, healthier lives. But as is always the case when exploring uncharted territory, we must take extra care to ensure that knowledge and innovation are not achieved at the expense of our ethics or our safety. As long as we proceed with an eye to ethics, we may one day soon be able to look back at retinal diseases and spinal cord injuries in much the way we view infectious diseases, as dreadful burdens overcome by human endeavor. Michael Rugnetta is a Research Assistant with the Progressive Bioethics Initiative at the Center for American Progress.